A Great idea for your corporate day - hold it at Lime Park or even at a venue of your choice. Have your unique birthday party at Lime Park with lessons, food, clowns, bouncy castles and much more all available. Make up your own package of activities. Add to your Fête of Fun Day with pony rides supplied by Lime Park. Come and try riding as a therapeutic activity. 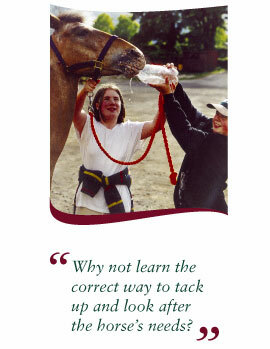 Learn the correct way to tack up and look after your horse. "Own a Pony for a week"